↑ Lund, Niels (2001). "The Danish Empire and the End of the Viking Age", The Oxford Illustrated History of the Vikings. Ed. P. H. Sawyer. Oxford University Press, 2001, p. 167–181. ISBN 0-19-285434-8. 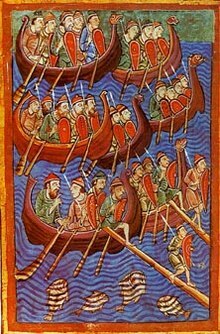 ↑ "History of Northumbria: Viking era 866 AD–1066 AD" www.englandnortheast.co.uk. ↑ Langmoen IA (4 April 2012). "The Norse discovery of America". Neurosurgery. 57: 1076–87, discussion 1076–87. PMID 16331154. ↑ Ross, Valerie (31 May 2011). "Climate change froze Vikings out of Greenland". Discover. Kalmback Publishing. สืบค้นเมื่อ 6 April 2013. ↑ "Vikings' Barbaric Bad Rap Beginning to Fade". News.nationalgeographic.com. 28 October 2010. สืบค้นเมื่อ 21 May 2012. หน้านี้แก้ไขล่าสุดเมื่อวันที่ 8 มีนาคม 2562 เวลา 10:51 น.